To watch her program, check out a wealth of other resources, and learn more about TED, please click here. Here is a direct link to her TED program. 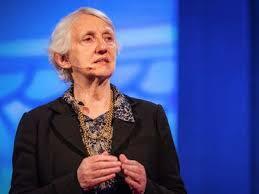 Philosopher Baroness Onora O’Neill thinks we are perverting trust. Considering how much stock we put into trust and assessing trusting attitudes, it’s something we don’t really understand, argues O’Neill. What we really need, she says, is not trust — but trustworthiness. In addition to her study of how we (wrongly) approach trust and accountability in civic life, O’Neill also focuses on bioethics and international justice. O’Neill’s most recent book, co-written with Neil Manson, is Rethinking Informed Consent in Bioethics, published in 2007. She was Principal of Newnham College, a college of the University of Cambridge, from 1992 to 2006, and President of the British Academy from 2005 to 2009. In early 2013 O’Neill was confirmed as the new Chair of England’s Equality and Human Rights Commission. She is a crossbench member of the House of Lords.